Do you get sick of flat-ironing your curly hair every day? Let it loose with this hairstyle. The combination of neutral highlights mixed into the hair (black, brown and blonde) are a fun way to show off your emo style without covering your gorgeous natural color. All the layers involved in an emo haircut are great for curls because they cut out weight that holds hair down. This is an amusing take on emo hair. The bright blue adds a much needed refreshing breath of air to the style, like a fairy in a magical wonderland. 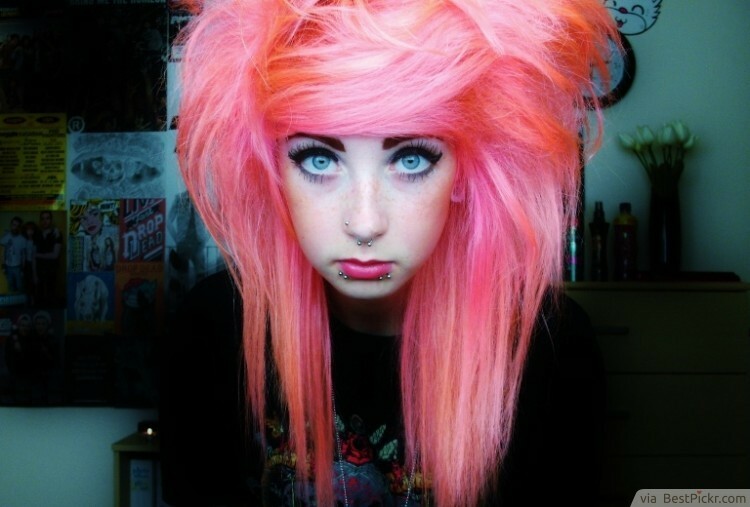 A solid head full of turquoise hair is femininely gorgeous and not as overwhelming as many other emo styles can be. Remember to condition your hair regularly to keep colored hair shiny and healthy. This is a gorgeous hairstyle with deep blue hues throughout. The lighter blue on top fades into a rich blue on the bottom with navy highlights. The romantic curls give this haircut a feminine style. Use a one inch barrel curling iron on small sections of hair to replicate this look. 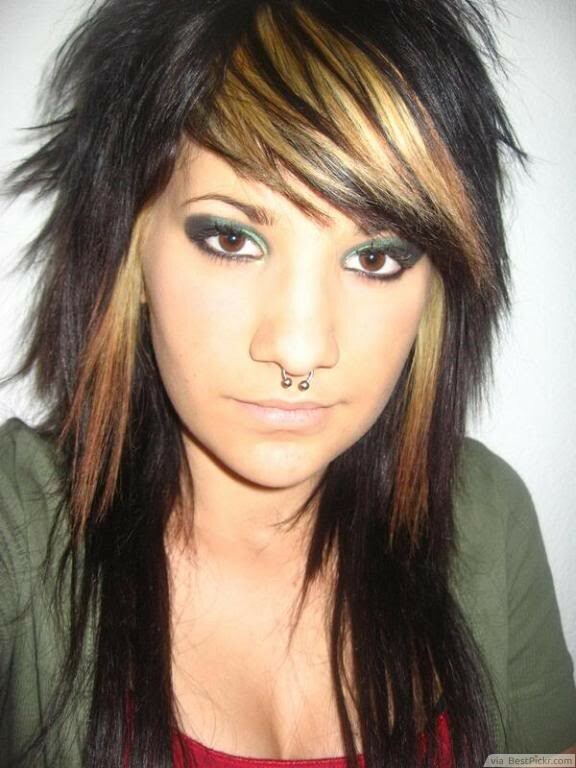 This is the classic style that comes to mind when you think cute Emo. A rich luxurious black color on long and thick hair. For volume this voluptuous, blow dry your hair upside down or with a round brush. Add a volumizer to the roots and a heat protective spray all over before you flat-iron. Then tease to your heart’s content. Smooth over the top of the hair gently and finish off with a touch of hairspray. A fishtail braid is a gorgeous hairstyle on anyone. Part your hair far to one side and leave a few strands of hair out on the opposite side of the braid. To fishtail your hair first separate it into two halves. Then take a piece from the back of the right section, cross it over the front and add it to the left section. Next, take a small section from the back of the left section, cross it over the front and add it to the right section. Keep this pattern going until you have a complete braid! It’s very simple and yet the end result is very intricate. 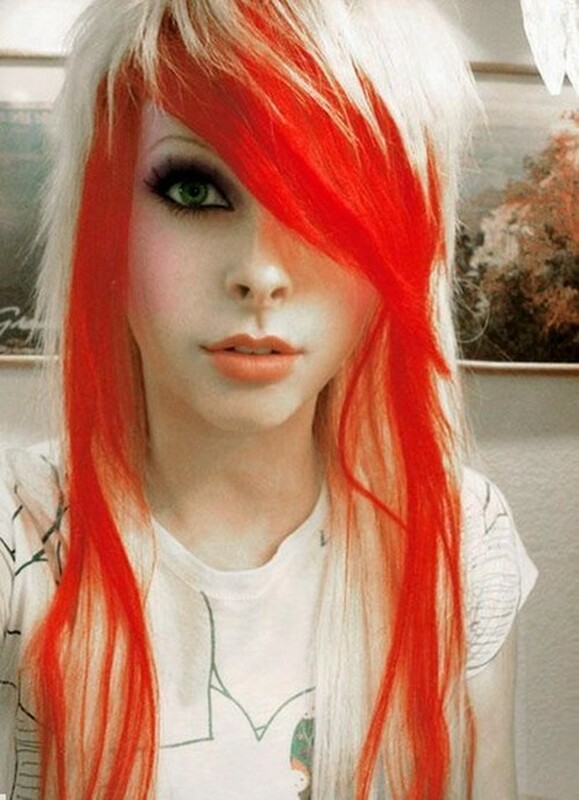 This long hairstyle is a whimsical take on the cute Emo fashion trend. The bright pink hue screams for attention while still showing off your penchant for obscure style. Make friends with your teasing brush and really go wild. The bigger the layer height on top, the better. With so many layers cut into the top of the head, try not to add too many to the bottom so you can avoid the hair getting stringy looking. If you have naturally dark hair, light brown highlights can be really complementing to your complexion. Also, when you concentrate those highlights in the front it creates a really pretty face framing effect. Have the layers in your hair cut with a razor to keep them edgy and jagged. This long haircut has short layers cut on top for a ton of texture and then not many in the rest of the hair which helps to maintain thickness on the bottom and avoid stringy hair. 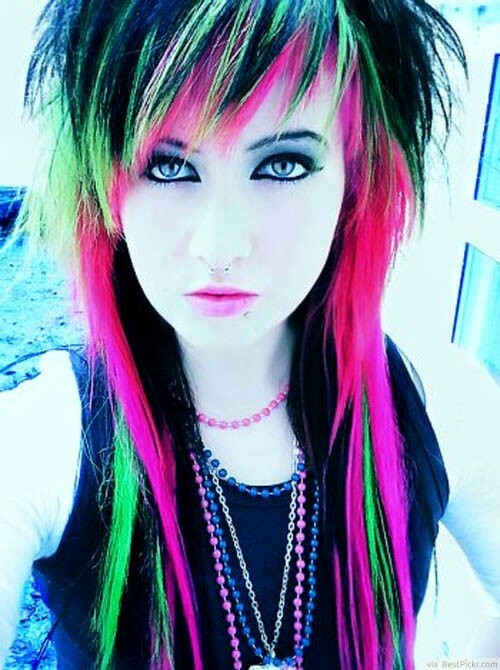 For an ultimate contrast effect, add neon green and pink highlights to black hair. Remember to bleach the highlights before adding color so they really pop.